While I’ve almost weaned my Kickstarter addiction, I’ve come across an interesting iPhone photography accessory that will probably take more of my money. 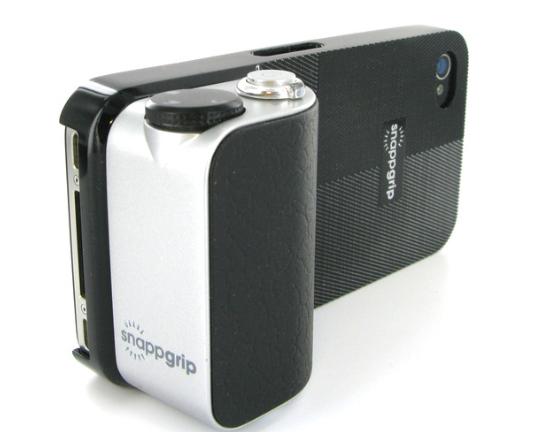 The SnappGrip has a simple purpose, to convert your iPhone 5 or iPhone 4/4S into a point-and-shoot camera. There are three parts to the system – a device case, the snap-on camera controls, and the companion app. Here’s a quick video about the project. Click here if you can’t see it. The connection between the control unit and the iPhone is achieved via Bluetooth. Some of the actions users can do with the controls include take a picture, focus on a scene, switch from portrait to landscape and back, turn the flash on or off, switch to video mode, and zoom in/out. On the underside of the control unit is a standard tripod mount, standby power switch, and micro-USB charging port. And there’s still time to snag the SnappGrip for nice price. Right now, you can make a pledge of £29 (around $46) and receive a device-specific case and the controller. That’s a nice bargain since the system is expected to retail for $99 when it hits the general market. With nine days to go in the campaign, the project has surpassed its goal and is estimated to ship to backers sometime next month. While the Kickstarter page uses British pounds, the SnappGrip can be shipped to backers anywhere in the world. I really like the idea of the SnappGrip, and am interested to see where the system goes. Even though there will be a companion app to take photos with, I’m glad to see that the creators are willing to provide their API to other camera app developer as well.